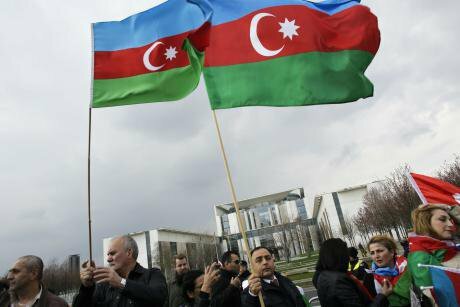 The EU’s inconsistent policy towards its eastern periphery has damaged its standing in Azerbaijan. A number of people who know the country well, including recently released political prisoners, tell me why. April 2016: protestors hold flags as they protest against the meeting of Angela Merkel and Armenia's president Serzh Sargsyan in front of the chancellery in Berlin. (c) Markus Schreiber / AP / Press Association Images. All rights reserved.The EU’s values-lite pragmatism towards its periphery is undermining its legitimacy in the South Caucasus. 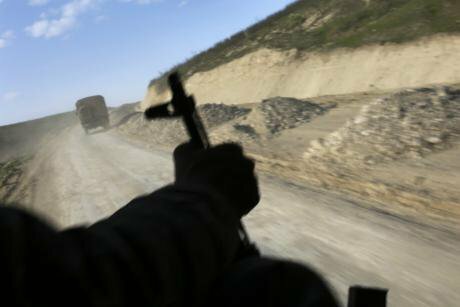 The violence that erupted in Nagorno-Karabakh in April 2016 exposed the weakness of the EU’s Eastern Partnership initiative in the region, as well as its “more-for-more” policy of promoting economic reform, democracy and human rights. The EU’s relationship with Azerbaijan is one that has been consistently criticised for ignoring authoritarianism in return for access to Caspian Sea energy. Interviews with recently released Azerbaijani political prisoners reveal how EU policy in the South Caucasus, as well as other developments such as the refugee crisis, is damaging its prestige and its attraction to countries in its periphery. The EU is a relatively new entrant to the complicated politics of the South Caucasus. Co-operation with Azerbaijan increased at the turn of the century due to the country’s significant energy repositories and became more formalised with the EU’s Eastern Partnership initiative, launched in 2009 along with Armenia, Belarus, Georgia, Moldova and Ukraine. Here, the EU’s “more-for-more” approach would — in return for internalising the acquis communautaire — grant benefits such as visa-free travel and privileged trade agreements. The relationship between Azerbaijan and the EU, however, has grown more strained as both sides have failed to grasp what the other seeks from the arrangement. Anar Mammadli, a prominent human rights activist, election monitor and political prisoner from 2013-2016, believes the EU sees Azerbaijan primarily as an energy corridor, while Armenia and Azerbaijan hoped the EU would assist in resolving the Nagorno-Karabakh conflict. Rasul Jafarov, an Azerbaijani human rights activist recently released from prison, told me that the “EU could have used gas pipeline negotiations with Azerbaijan to raise promotion and protection of human rights, as well as implementation of democratic reforms in Azerbaijan.” On the contrary, EU leaders have gone out of their way to accommodate the Aliyev regime. Worse, the Council of Europe, the institution responsible for promoting and upholding human rights and democratic standards on the continent, has been shown to be impotent over events in Azerbaijan. Gerald Knaus believes that the attitude of EU leaders and institutions towards Azerbaijan’s failure to implement EU values, and increasing repression under Ilham Aliyev, reveals the growing indifference towards human rights values among European leaders. Nowhere is this more clearly seen than the current right-wing governments in Hungary and Poland. Rasul Jafarov commented that “unfortunately the [Azerbaijani] government uses this moment to present the EU and western countries to the people as unattractive institutions and countries, blaming them for violations of human rights and freedoms.” Even an official from the European External Action Service (EEAS) believes a “one size fits all” model has failed in Azerbaijan. The lack of a clear strategy from the EU, as well as declining commitment to its values, gives autocrats the opportunity to make charges of “double standards”. Why does the EU not assist or denounce the status quo in Nagorno Karabakh, for instance with sanctions towards Armenia? Likewise, critics of the EU’s human rights policies can argue that Azerbaijan is as guilty on human rights as Belarus and Uzbekistan, therefore why not sanctions for the Aliyev regime too? The combination of inertia and cynicism has had a predictable outcome in Azerbaijan. Authoritarianism is critical in prolonging unresolved conflicts, such as Karabakh. The Putin regime needs these enclaves to continue to exercise control over former Soviet countries. As well as supporting Armenia, Russia has sold weapons to Azerbaijan, leading to an arms build up in the region. When these regimes come under pressure or suffer economic problems, they plough rhetoric and resources into the vortex of frozen conflicts. Over the past year, economic problems, caused by a fall in oil prices and subsequent currency devaluations, have mounted for the Aliyev government. This was aptly demonstrated in April as violence reignited over Nagorno Karabakh. As Thomas De Waal, an expert on the South Caucasus, predicted in January, the temptation for the Azerbaijan regime when faced with internal strife is to play the “Karabakh card”. Demonstrating how economic difficulties have weakened the government, a number of political prisoners were pardoned in April this year, coinciding with Aliyev’s visit to Washington. The current situation provides the west with an opportunity. Democratic institutions, respect for human rights and a concerted attempt to prevent corruption are all areas where the EU, as well as the Council of Europe and the OSCE, purport to be pushing for reform in Azerbaijan. Pierre Vimont, former Executive Secretary-General of the European External Action Service, recently said — regarding the EU’s attempts to promote reform in Ukraine — that a concerted effort to reduce corruption and promote growth and diversification will be the surest way to bring conflict zones back into the fold and foster stability. Ramis Yunus, a former chief of staff to the Azerbaijani government and parliament, told me that “the conflict in Nagorno-Karabakh cannot be resolved in the absence of democratic norms in Azerbaijan”. This, however, does not seem to be the view in European capitals. Here, a shift to hard-headed realpolitik seems to be the order of the day. A 2015 report by influential German think tank Stiftung Wissenschaft und Politik suggested that we are now entering a new era of foreign affairs based on interests, rather than values. The European Council on Foreign Relations suggested something similar when describing the EU’s policy towards Belarus in 2015 — that is to say, the EU would be better served cultivating friendlier ties with the Lukashenko regime instead of applying sanctions after each new crackdown on human rights. As John Bew shows in his new book Realpolitik: A History, even the original author of a much maligned and misunderstood term (realpolitik) believed that the pursuit of higher, liberal aims was compatible with short term pragmatism. Clearly, the EU’s response to the migrant crisis is denting its stature in its wider neighbourhood. How EU leaders respond to the current tumult in Turkey, particularly as president Erdoğan has raised the spectre of reinstating the death penalty, will be a further test of their commitment to its values. Security, economic growth and values such as democratic accountability are precisely what gives the EU clout as a soft power. Events in Ukraine show how the apparently benign Eastern Partnership initiative was – to use regional expert Svante Cornell’s term – “a potent soft power tool”. As Cornell has written, institutionalising the EU’s acquis would be “fatal for Putinism”. A resolute “more-for-more” EU strategy, therefore, is more appropriate than ever. Despite the damage done to EU prestige as a result of the Brexit referendum in the UK, the pull of Europe is still strong for countries on its eastern periphery. The South Caucasus is often viewed in zero-sum terms. Thomas De Waal has written that, “it seems an almost inbuilt problem of the South Caucasus that a positive development in one place causes alarm in another”. With this in mind, a regional approach looks a better bet for EU politicians, based upon the EU’s strengths: economic development and gradual incorporation of its shared values. Azerbaijan is rightly proud of its all-too-short lived secular, democratic republic of 1918-1920. Even the current regime likes to tout this period as unique: “the first Parliamentary Republic in the history of the people of Azerbaijan, the first democratic, legal and secular state in the whole East and Islamic world”. As such, this history can also be used to demonstrate that “EU values” are not alien to Azerbaijan. Ramis Yunus told me that “From the history of Azerbaijan during the years 1918-1920, we know that human rights, the rule of law, and various other democratic issues were priorities back then, and thus the Azerbaijani society has historically been ready for this”. Anar Mammadli, meanwhile, said that this first republic shows that “the final destination has to be EU membership, history shows us this. Europeanisation is part of the foundation of Azerbaijan state in 1918”. It is the wider commitment to these shared values that the EU currently lacks.